Adieu to the 2015-16 Ski Season and to Gracies! The ski season is down to its last gasp. Of course for many the season ended a month or more ago. This winter’s weather and lack of real snowstorms had left most people ready to move on to summer activities. Over the past couple of weeks I’ve been getting a lot of “you can’t still be skiing” comments from even my skiing friends! However this past week the remaining diehards were treated to some really good spring skiing! Congratulations to the Stowe snowmaking and grooming crews for providing good conditions throughout the season and allowing us to enjoy some spring rewards. The end of ski season provides an interesting mix of emotions. There’s the happiness of tailgate gatherings with friends and there’s some sadness knowing that it will be several months before skiing returns again. This season there’s at least one more reason for mixed emotions: Gracie’s, a Stowe landmark for almost 25 years, will be closing on April 23rd. “Archie” and Sue Archdeacon have decided to take a well-deserved retirement. Stowe has always been fortunate that many people who initially came here for the skiing have stuck around to become great contributors to the community. So it was with Archie and Sue. Sue came to Vermont for college, graduating from Johnson State in 1971. She fell in love with the area and decided to stay. Paul, aka “Archie”, came to Stowe for the 1972-73 ski season, working as a dishwasher at the Stowehof to support his skiing. After a winter of ski bumming, he was supposed to return to Massachusetts to pursue a teaching career. But instead Archie decided to stay in Stowe. Archie and Sue’s paths would cross when both of them were working at the Partridge Inn during the 1973-74 ski season. They would get married in 1980. There were no correct answers to last week’s trivia. Both Lyndall Heyer and Jean Santa Maria thought it was the Stowe Away, but according to an article published in the August 2009 issue of Business People, it was the Partridge Inn. 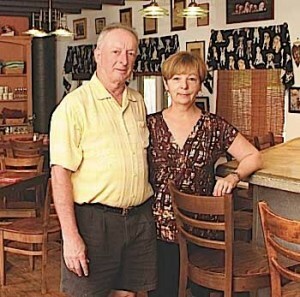 Archie and Sue worked in several Stowe restaurants and inns. Archie became manager of the Matterhorn in 1977. During the 1980s, Sue would be manager of Ye Olde England Inn. 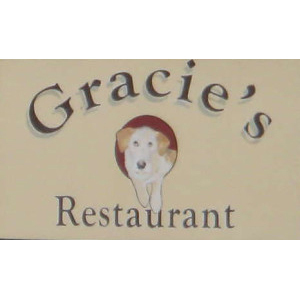 It would be July 1991 when they finally opened their own restaurant, Gracie’s! There’s a lot that goes into creating a successful restaurant. It takes even more to run a successful restaurant for twenty five years. Congratulations, Archie and Sue for twenty five years of success! As I write about Gracie’s, the theme from Cheers keeps running through my head: “Where everybody knows your name.” You felt more like a friend than a customer. And it wasn’t just the locals. Tourists making return visits would quickly become friends as well. Gracie’s loyal staff helped reinforce this friendly atmosphere. This column is about memories. Thank you Archie, Sue, and the entire Gracie’s staff for countless memories through these 25 years! 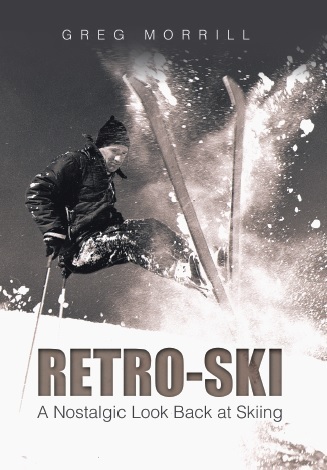 This wraps up another RetroSki season. Thank you to all my readers. Particular thanks to those who have shared their memories and trivia answers via blog posts, e-mails, and in person. I really appreciate your input as it keeps me going. I look forward to next season. Hopefully Mother Nature will be a little more cooperative. Have a great summer!